Warmer air has raised temperatures in the upper levels of the oceans 0.9°F (0.5°C) over the past four to five decades and increased global SST an average of 0.18°F to 0.36°F (0.1°C to 0.2°C) since 1976. Although the variability of SST is natural, the rise since the 1970s cannot be explained by natural causes. Warming ocean temperatures have resulted in rising sea level, increased erosion, and a change in deep ocean circulation. Recent sea level rise. 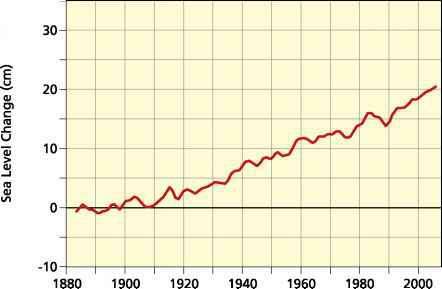 The rise in sea level in centimeters from 1880 to 2005. The red line represents the three-year average. and El Nino-Southern Oscillation (ENSO) events, account for only a small part of this increase. Higher sea level poses a problem during storms because waves and storm surge take place at a level relatively higher to the land. (Storm surge is a local rise in sea level due to winds blowing water up against a shoreline.) Higher storm surge and waves cause flooding, erosion, and the loss of wetlands. Rising seas caused by climate change could destroy half the mangrove forests on some Pacific islands; although, so far, the changing of mangrove forests into shrimp farms has had a far greater effect on tropical coastlines. In the past two decades, 35% of the world's mangrove forests have been lost. Globally, 70% of the world's sandy beaches are eroding. Sea level rise is partly to blame, but other human activities bring greater damage. These include the loss of natural features that protect the shoreline, such as mangrove forests and coral reefs; sediment starvation due to dam construction on rivers; and subsidence due to groundwater pumping. Beach loss is bad for coastal communities, and protecting shorelines has become a major enterprise in the countries that can afford it.